Appreciate the collections at Jim Thompson House and Vimanmek Mansion. For shopping fun, head to Damnoen Saduak Floating Market or Chatuchak Weekend Market. Step out of Bangkok with an excursion to Dreamworld in Thanyaburi--about 1 hour away. Spend the 24th (Sun) exploring nature at Dong Phayayen-Khao Yai Forest Complex. 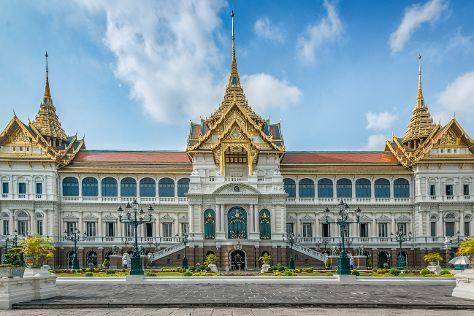 There's lots more to do: step into the grandiose world of The Grand Palace, take in the spiritual surroundings of Temple of Dawn (Wat Arun), meet the residents at Safari World, and get outside with SEA LIFE Bangkok Ocean World. To find other places to visit, more things to do, maps, and tourist information, read our Bangkok travel itinerary planner. If you are flying in from United States, the closest major airports are Suvarnabhumi Airport and Don Mueang International Airport. In June, daytime highs in Bangkok are 93°F, while nighttime lows are 79°F. Cap off your sightseeing on the 26th (Tue) early enough to travel back home.